Loudspeakers Sonus Faber Signam, Sonus Faber Musica and a Bow Technology Wizard system. After good experience with platforms RST-38 and RAF-48 (read HERE) we were more and more interested in what the manufacturer has to offer. Strolling through the company’s catalog, its web page and price list we were amazed – the amount of available elements, their exotics and esoteric was putting even us off scale, us who saw many different things. Like I say – we saw many things, we heard lots of products, which seemed nonsensical at first glance, strange and often just stupid, after listening, after comparing, they seemed useful, changed the sound in a more or less obvious way, many times to the best. I know now, that I cannot laugh at everything I see, and what escapes my experience. Many years of experiments, hundreds, or maybe even thousands, hours of listening sessions taught me one thing: before I exclude anything via listening, it is not excluded. It may be suspected, temporary, but still possible. The case of Acoustic Revive is more interesting, because the man behind it is an engineer, and he backs up the working of each and every device with a concrete theory (physics) and measurements, made in universities. This is not a “mad inventor”, who listens to something and starts selling it. The research made by this company is very rigorous and resembles normal scientific experimenting. First there is theory, then practice (listening session), then measurements and then the final listening sessions. If the effects are repeatable in all Mr. Ishiguro systems, then they go to manufacturing. Everything that deals with vibration, their transmission and their cessation is quite obvious for me. This is why for me this part of the price list was very interesting for me. The more, as two products from that range – platforms – turned out to be better, than their description in the company materials. 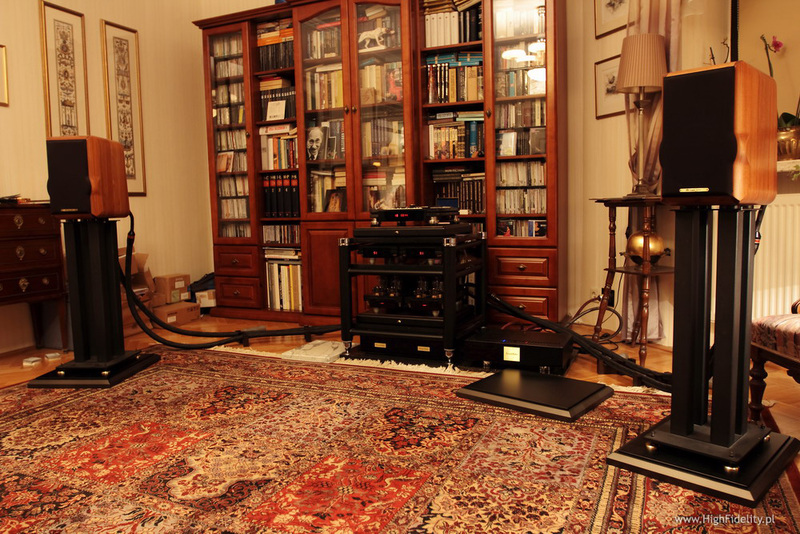 This time the meeting should be at Janusz’ place, with his ultra-precise and mega-transparent system based on Ancient Audio products (the player Lektor Grand SE, amplifier Silver Grand Mono and conditioner First Generator), modified loudspeakers Sonus Faber Electa Amator (I), cables from Acrolink and Tara Labs and Base rack. The methodology of this test was different than with the platforms. Because we had many different products to listen to, in many places, I decided to prepare some kind of “reduction”, we will use all the products at once, placing them all where they should be, and then removing one by one, reducing one “decoupling” level after another. Because we knew the influence of the platforms RAF-48 under the electronics and RST-38 under the loudspeakers, those stayed in their places all the time. in the second wave the SPU-8 alone, placed under the spikes of the loudspeaker stands. Both the cable supports RCI-3 (8 pcs, four per channel) and the quartz resonators we left at the end, collectively assuming, that if they will introduce any changes, those will be minimal. But as it turns out, life writes its own scenarios. But about that after the main part. Because for us it was most important, how in a system with the anti-vibration platforms already applied, which do work – and how! 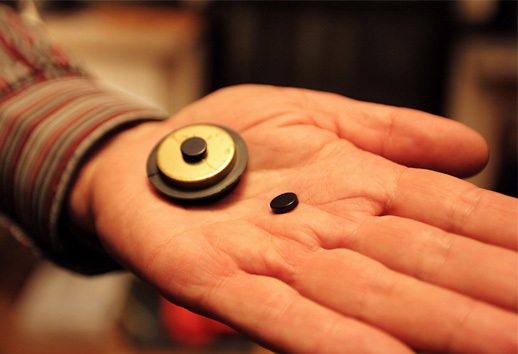 – and which we all bought, the anti-vibration elements will work, which from the point of view physics, and our experience, should have substantial effects on the sound – RIQ-5010 and SPU-8. Like I say, the described experiment was based on reduction – we initially applied all the important supports (except for the QR-8) and we then removed them from below the elements. Abba, Super Trouper, Polar Music Production/Universal Music Japan, UICY-9508, CD. Peggy Lee, Mint Jazz, Capitol/Toshiba-EMI, TOCJ-9327, CD. Stan Getz, The Peacocks, Sony Music (Japan), SRCS 9186, Master Sound, CD. William Carter, Santiago de Murcia, Linn Records, CKD 288, SACD/HDCD. 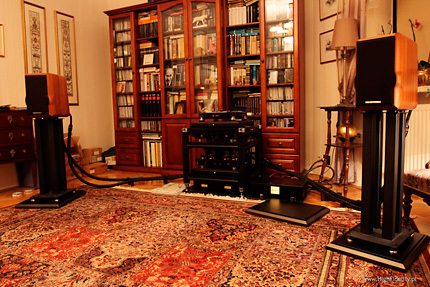 The first experiment was to use the supports RIQ-5010 under the feet of the Ancient Audio Lektor Grand SE. The device was first equipped with Finite Elemente Cerabase feet, and the semitransparent, smoked rings were placed under those. The RIQ-5010 and RIQ-5010W (smoked and transparent versions) of the feet supports are made from colored or natural quartz. Each ring has a diameter of 50mm and is 10mm thick. Those can be placed also atop of a device or close to the connectors. Standard isolators generate a sound that is unique to them, being a derivative of the mechanical characteristics of a given material, and usually the only thing counting is if the sound is liked by the listener or not. According to the Acoustic Revive company materials they have tested every available material, which generates nothing from itself and which improve the quality of the sound. It turned out that smoked and clean quartz. They allow – as we can read – to extract “clearer, lively sound”.